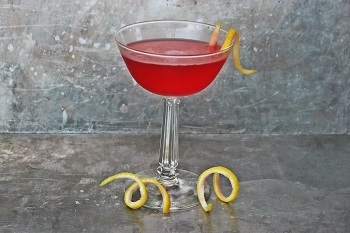 Welcome to the first guest post by Natalie Migliarini of BeautifulBooze.com! Natalie is a mixologist, cocktail stylist, photographer, and recipe developer based out of Seattle, WA. Her passion is discovering new and creative ways to use booze. Her specialty is creating fabulous cocktails with seasonal ingredients. She believes that every occasion begins and ends with a beautiful drink. I saw her lovely pictures of her cocktail creations and knew I wanted to share her lovely pictures with my readers. And better yet – she calls Seattle home, which is also home to more than 40 craft distillers! So it was a natural fit that she create cocktails with the spirits she has so close at hand. Each month, Natalie will showcase a craft spirit in one of her gorgeous creations, so make sure to check back for the latest one! You can also follow her on Twitter or check her out on Instagram. “Scofflaw”- n. a person who flouts the law, esp. by failing to comply with a law that is difficult to enforce effectively. I would say that’s a pretty accurate description of this drink – whiskey scoffing at the relative sweetness of grenadine, the lemon and vermouth adding a bit of balance. All in all, the ingredients get along much more famously than the bootleggers and the law during Prohibition! 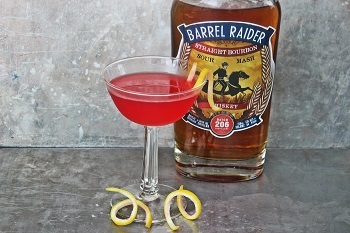 Natalie had Batch 206‘s bourbon, Barrel Raider on hand, so she used that in place of rye. Yum! Combine all ingredients with ice and shake. Strain into a chilled glass and garnish.